Do you brush your teeth every day and floss regularly? Good – now what about keeping up with your regular dentist visits? Although personal hygiene is common, many people forget the important role their dentist plays. A routine check-up might seem like a minor thing to do, but it can have a huge effect on your overall dental health. Without frequent visits to your dentist, you run the risk of needing extreme dental care. This is often costlier and painful. Skip the trouble of intense care and stay on top of your dental needs. One of the most important ways to do this is with regular dental x-rays. Here’s everything you need to know about x-rays for preventive dentistry. Before a dentist asks you to open wide, they’ll want to see an overview of your dental health. X-rays allow them to do just that. 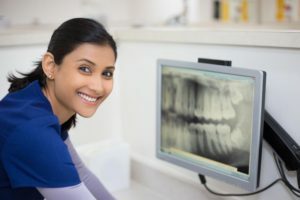 Therefore, you can typically expect x-rays to be done every time you see a new dentist. If it’s been a while since your last visit to your regular dentist, they’ll start with this too. Although the machine does most of the work, you need to pay attention to what the dental assistants tell you to do. A slight move of your tongue or awkward bite can mean you end up needing multiple tries for one x-ray. Even a shifting your body can alter the image. As such, it matters that you be a good listener and do exactly what is asked. Not only does this move things along, but it reduces your radiation risks. Whether you get all your x-rays finished in one try or after a few attempts, you’re still being exposed to radiation. Thankfully, you don’t have to panic because there is a very small amount of radiation in each set of x-rays. Although radiation comes in small doses, be proactive about your exposure every time you get x-rays done. Despite the time they add to your dental appointment and the radiation over the years, x-rays are still necessary. No matter how skilled a dentist is, they can’t do a full assessment without them. This part of preventive dentistry will confirm or deny what a dentist thinks is happening with your health. Wouldn’t you rather catch a cavity before it turns into a root canal or know early on to start planning for wisdom tooth removal? X-rays can help you, and your dentists, figure out such treatment options. Give your smile the attention it deserves. Beyond at-home care, get back in the dentist’s chair. Keep this x-ray information in mind as you go to your next visit and don’t be afraid to ask questions. Contact us today to set up your next appointment!